BUTUAN CITY, Feb. 20 (PIA) -- Aside from the parental care and protection given by the parents to their children, the government and the Department of Health - Center for Heath Development (DOH-CHD) Caraga still want to ensure that they will not acquire measles and suffer from its complications. Measles cases are rising in the Philippines with the Department of Health (DOH) declaring measles outbreaks in five regions in the country, including in Metro Manila. The DOH reported over 4,300 confirmed measles cases from 1 January to 10 February 2019 – more than double the number of cases compared to last year. Severe complications from measles have also claimed the lives of 70 people, 1 in 3 of which were children younger than 9 months old. 1. 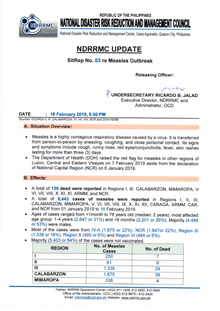 What is the measles situation in the Philippines? The Department of Health (DOH) declared measles outbreaks in five regions in the Philippines – Metro Manila (NCR), Central Luzon (Region 3), CALABARZON (Region 4A), Western Visayas (Region 6), and Central Visayas (Region 7). 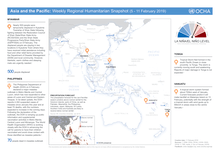 Other regions also have rising measles cases and are at risk for possible outbreaks if the epidemic is not contained. 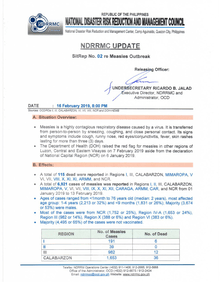 Last year, measles outbreaks were also declared including in Mindanao (Davao City, Zamboanga City) Metro Manila (Taguig City), and some areas in Negros Oriental. 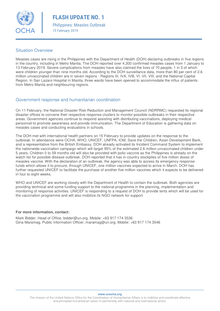 CEBU CITY, Cebu, Feb.12 (PIA)--The Department of Health (DOH)-7 has placed public health units and hospitals on ‘code white’ alert to address the measles outbreak in Central Visayas. This means that all hospital staff is ready to cater to patients with measles and that they will be prioritized. In a recent AGIO-PIA7 Forum, Dr. Shelbay Blanco of DOH said that the department has strengthened all their preventive measures to ensure that the cases of measles will no longer increase. 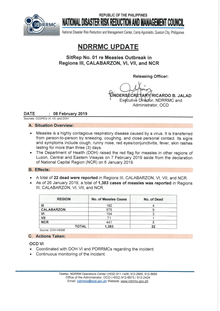 The Department of Health (DOH) raised the red flag for measles in other regions of Luzon, Central and Eastern Visayas on 7 February 2019 aside from the declaration of National Capital Region (NCR) on 6 January 2019. In continuation of efforts to contain the measles crisis in the country, the Philippine Red Cross (PRC) immunized a total of 1,307 children in Baseco, Manila for the first phase of its community-based measles control program. Over the weekend, PRC deployed 250 volunteers composed of doctors, nurses, health workers, and logistics assistants to conduct house-to-house vaccination and station-based operations in Corazon Aquino Health Center, in partnership with the International Federation of Red Cross and Red Crescent Societies. Measles is a highly contagious respiratory disease caused by a virus. It is transferred from person-to-person by sneezing; coughing, and close personal contact. Its signs and symptoms include cough, runny nose, red eyes/conjunctivitis, fever, skin rashes lasting for more than three (3) days. The Philippine Red Cross (PRC)’s emergency medical unit (EMU), which serves as an extension wing for patients with measles at the San Lazaro Hospital in Manila, is now fully operational. The installation of the 40-bed EMU addresses the overflow of patients in line with the declaration of a measles outbreak in various part of the country, including the Metro Manila. 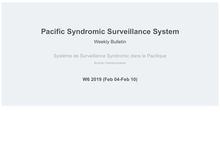 Chairman Richard Gordon, who leads PRC’s response to the outbreak, said the EMU mirrors the organization’s full support to the government and its health partners. The Philippine Red Cross (PRC) assures its full support to the government in responding to the increase in measles cases by providing humanitarian assistance, especially through the installation of emergency field medical tents in crowded hospitals. 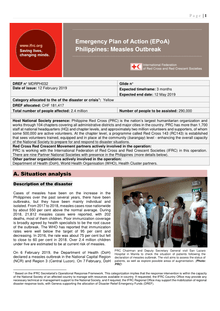 Following the Department of Health (DOH)’s declaration of a measles outbreak in various parts of the country last February 6, PRC set up a 20-bed and a 50-bed Emergency Medical Units (EMU) or outdoor hospitals at two of the most crowded hospitals in Manila. Health Secretary Francisco T. Duque III called for a coordination meeting with several government agencies in response to the measles outbreak in several regions in the country. The Department of Health (DOH) today points to vaccine hesitancy as one of the reasons for the recent measles outbreak in some regions of the country. Validated data from different regions of the country by the Epidemiology Bureau of DoH revealed that from 1 January to 9 February this year, a total of 4,302 measles cases have been reported, with 70 deaths. 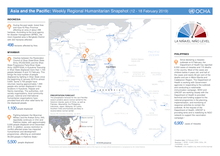 MANILA, 8 February 2019 – UNICEF is alarmed at the recent reports of various occurrences of measles outbreak across the Philippines. Reported incidences of death and illnesses in children from the vaccine-preventable disease is unacceptable. Recent reports from the DOH and the World Health Organization (WHO) show there are more than 20,000 reported measles cases in the country as of December 2018, a 500 per cent increase compared to last year. Nearly 500 people were temporarily displaced in Kyaukme Township of Shan State following fighting between the Restoration Council of Shan State/Shan State Army (RCSS/SSA) and the Shan State Progressive Party/Shan State Army (SSPP/SSA) on 9 February. The displaced people are staying in two locations in Kyaukme Town where they have received initial assistance including food and other relief items provided by the Department of Disaster Management (DDM) and local community. However, blankets, warm clothes and sleeping mats are urgently needed. During 2018, a total of 21,812 measles cases were reported in the Philippines: a 376% increase with 2017. With a Case Fatality Rate of 0.93%, 202 people died of the disease in 2018, most of them children. 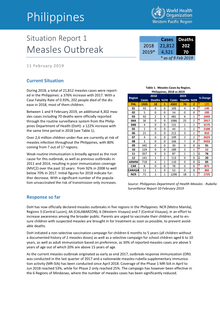 Between 1 and 9 February 2019, an additional 4,302 measles cases including 70 deaths were officially reported through the routine surveillance system from the Philippines Department of Health (DoH): a 122% increase with the same time period in 2018 (see Table 1). FOLLOWING the midnight visit of Chairman Richard Gordon to the measles patients confined in San Lazaro Hospital in Manila, the Philippine Red Cross (PRC) is closely coordinating with the Department of Health (DOH) in providing assistance relevant to the surge of patients due to the measles outbreak. Gordon said PRC is ready to provide medical interventions, including the establishment of a 100-bed emergency medical unit (EMU) and welfare desks at San Lazaro Hospital (SLH).